I am appointed to the Chief Advisor/ Coordinator of the project of the Grand Egyptian Museum Conservation Center (GEM-CC) Phase II. The project has begun the Phase I as a preparation phase from June 2008 and has supported the Egyptian counterparts to establish the GEM-CC. From this July, the Phase II has been launched to continue the technical cooperation for the next five years. The project office is located at the outskirt of the famous Three Great Pyramids in Giza. The Tahrir Square where the January 25th Revolution was centered is distanced about 40 to 50 minutes from our office. Within the site of the office, the new national archaeological museum of Egypt, Grand Egyptian Museum (GEM) will be constructed. After the completion of the museum, all of the museum collection will be conserved and preserved at the GEM-CC which is located in the museum site. The great part of the cost of museum building construction, exhibition, interior and landscape design, and ICT development will be covered by the Japan’s Official Development Assistance (ODA) known as Yen loan. In addition, capacity development of GEM-CC staffs is provided through this technology transfer project. The project aims to develop the capacity of conservation, science, archaeology, database experts all of whom have essential role to manage a museum, through training courses given by Japanese experts both in Egypt and Japan. The best conservation experts in Japan are involved in our project as lecturers of the training courses. Through passing on the Japanese conservation knowledge and techniques to the Egyptian experts, and further they are utilized to improve collection environment for a long term, I believe that the new museum will be one of the best museums in the world not only because of its size and collection itself, but also the quality of the museum design and conservation environment. I hope that the GEM will be an internationally well-recognized museum managed by Egyptian experts in near future. I have lived in Asia, Africa and the Middle East. There are not many countries like Egypt which has such rich cultural heritage. Egypt has more than four thousand years of history and cultural heritage. I hope that the Egyptian have more opportunity to familiarize themselves with their history and culture through their cultural heritage through the GEM museum collection. 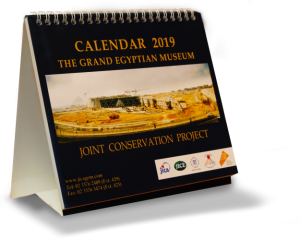 The Project of the Grand Egyptian Museum Conservation Center (GEM-CC) has got into the Phase II of the project on 1st July , 2011. During the phase, we will provide various training courses, in the next five year, for Egyptian conservators and scientists of GEM-CC as well as curators who are responsible of storerooms at GEM-CC based on the capacity development plan formulated during the preparation phase (Phase I). Mr. Kaoru Ishikawa, Japanese Ambassador to Egypt, Mr. Nobuhiro Ikuro, Chief Representative of JICA Egypt Office and Mr. Yasunori Matsuda, JICA Expert in Conservation Science will attend the inauguration ceremony of the Grand Egyptian Museum Conservation Center to be held on 14th of June at 11:30am at its premises with Mrs. Suzan Mubarak, the First Lady of Egypt, in attendance. In cooperation with the Executive Authority of the Grand Egyptian Museum (GEM), the Ministry of Culture, Japan has been providing technical assistance to the Grand Egyptian Museum Conservation Center, in addition to a provision of a loan of 35 billion yen for the construction of the Grand Egyptian Museum. Japan International Cooperation Agency (JICA) signed the proceedings of the cooperation with Ministry of Culture, Egypt in April, 2008, and the technical cooperation for the center started in June, 2008. The technical cooperation project consists mainly of the following two components: training of the GEM conservators and supporting of artifacts database development. Experts in conservation and experts in database development are currently implementing the project. The Conservation Center is prerequisite for opening the GEM because the artifacts to be displayed in the GEM first need to be gathered from various places in Egypt to the Conservation Center, where they are conserved or/and restored before being displayed in the museum. Therefore, it is important to have good conservation facilities and well trained conservators before opening the GEM. The accurate database on the artifacts is also required to open the GEM because the selection of the artifacts for display and their transfer to the museum can be done only on the basis of the accurate information. Especially, information such as the stored places and the sizes of the artifacts is important to make a transfer plan of the artifacts. At present, however, there is no comprehensive artifact inventory available in any museum and storeroom the artifacts for the GEM are stored. This is the reason why we are supporting development of the database on the artifacts for the GEM. Japan has been supporting capacity development of the conservators of the Grand Egyptian Museum for the last two years. So far, JICA has conducted several workshops on conservation of various materials such as paper, textile and metal in Egypt, and many Egyptian conservators have been to Japan for training. . From the next year, the comprehensive training program is expected to start, through which conservators could develop various skills required during the process starting from transportation of the artifacts from all storerooms till the display and storage. Last April, Japanese conservation experts joined the project, namely, Mr. Yasunori Matsuda, Former Director of the Conservation Research Center in Tohoku University for Art and Design, and Mr. Kaoru Suemori, Conservation Training Organizer. Currently, in addition to organizing training courses in Egypt, they are working on two issues: environment management and conservation management of the GEM-CC. In the field of environment management, they are attempting to introduce integrated pest management (IPM) to the GEM-CC. One of significant subjects in a museum and storage for preserving cultural properties is sheltering from fungal and insects’ damages. Therefore, Japanese experts, in cooperation with Egyptian conservators, started to monitor the current situation of insects and fungi in the GEM-CC using simple methods such as placement of traps in all the rooms and corridors of the GEM-CC. They also plan to monitor humidity, temperature and harmful materials inside the Center soon. Japanese experts also assist their counterparts in setting up a conservation management system. The GEM-CC is expected to be one of the largest conservation centers in the world and its success heavily depends on a good management system. In order to set up a management system appropriate to the GEM-CC, Japanese experts started to hold a weekly meeting with the heads of the conservation and chemical analysis labs. Japanese and Egyptian conservation experts are currently building a relationship of mutual trust so that they can bring in their expertise and experience to come up with an appropriate management system together. Japan will continue to contribute to human capacity building of GEM-CC. Two conservators of the Grand Egyptian Museum Conservation Center have returned to Egypt after having finished two month advanced training course on textile conservation in Japan. They will share what they learned from the technical training as well as cultural experience in Japan on October 1, 2009 at SCA office in Lazokly Square. The training course was conducted as a part of the JICA Grand Egyptian Museum Conservation Center Project. Nine more conservators have already been sent to Japan to attend training courses on conservation equipment and on packing and transfer of artifacts. Having completed the first year of the project, we came to believe that one of the most important contributions the project could make is introducing a Japanese systematic way of working. We hope that the participants of the training course in Japan will learn not only expertise in conservation but also a different way of working through hands-on living experience in Japan. This project will continue to contribute to capacity building of GEM conservators so that they can create a work system fit to their own culture and environment.